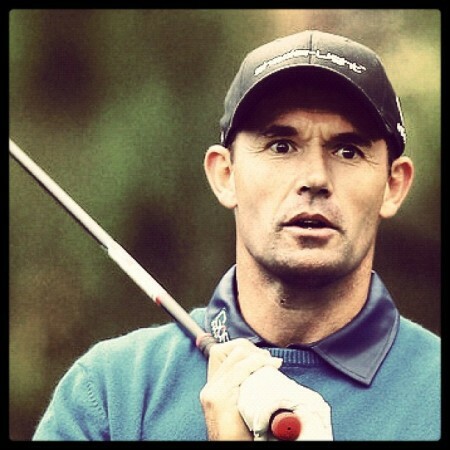 Timing is everything and Padraig Harrington will be hoping that the best is yet to come after he rediscovered his putting touch and fired a superb six under 66 to move into contention for what could prove to be a crucial victory in the AT&T Pebble Beach National Pro-Am. While winning majors is the Irish star’s main goal as he moves into his 40’s, he still wants to contest this year’s Ryder Cup and knows that he must force his way into field for this month’s WGC-Accenture Match Play Championship to boost his chances of winning a seventh cap. The world No 93 must make it into the top 65 in the world on Sunday night and he knows that only victory will do if he is to take his place in the field in Tucson. And he is perfectly placed to strike over the final two rounds on the Monterey Peninsula after carding seven birdies and just one bogey in a morale-boosting effort around Pebble Beach Golf Links - the best round of the day on that course during a long and wet day on the Pacific coast. Four birdies in a row from the second and another at the world famous par-three seventh catapulted the Dubliner into the mix. And while he could easily have made another handful of birdies after the turn, he reacted well to an untidy bogey six at the 14th with birdies at the 15th and 18th. In the end, he finished the day on eight under par and tied for third place, just four strokes adrift of leader Charlie Wi, who added a 69 at Pebble Beach to his opening 61 at Monterey Peninsula Country Club. What’s more, Harrington and 14-handicap amateur partner JP McManus have a huge, seven-stroke lead at the top of the pro-am standings after adding a 60 to their opening 57 to move to 25 under par. Wi leads by three strokes from two-time Pebble Beach Pro-Am winner Dustin Johnson, who shot a level par 72 at Spyglass Hill with Harrington tied for third with Brian Gay, Vijay Singh, Danny Lee and Brendon Todd. Poor weekends have been the the rule rather than the exception for Harrington in the three and half years since his most recent US victory - the 2008 PGA. And it won’t be easy to get over the winning line in California this week with the likes of Hunter Mahan, Phil Mickelson and Tiger Woods all lurking. Mahan (68 at Pebble Beach) and Mickelson (65 at Monterey) are tied for eighth, a shot behind Harrington on seven under par with Woods a stroke further back and six off the pace in joint 17th after a two under 68 at Monterey Peninsula. The 14 time major winner was superb from tee to green but he had 33 putts, telling the press that it was mainly due to leaving his approach shots in the wrong places on the greens. In contrast, Harrington was in inspired form with the blade for most of the day, taking just 28 putts in a round characterised by solid play from tee to green. Having failed to birdie the par-five sixth up the hill, Harrington flicked a wedge to 15 feet at the short seventh and holed the putt to go five under for his round and while he missed an 18 foot chance at the eighth, he went out in 31. After missing chances from inside 15 feet at the 10th and 11th, Harrington bogeyed the par-five 14th when he bunkered his tee shot and miss the green with his third from 188 yards and could get close with his pitch. But he hit back straight away, holing from seven feet at the 15th before rounding off an excellent day’s work with a birdie at the par-five 18th. Bunkered in two, 93 yards from the pin, he hit his third to 11 feet and holed the putt. Padraig Harrington bounced back from his missed cut in last week’s Northern Trust Open when he carded a three under par 69 in the first round of the AT&T Pebble Beach National Pro-Am at Spyglass Hill. According to the PGA Tour statistics for the round, the world No 10 hit 50 percent of the greens in regulation, which does not suggest that he solved the technical problem that dogged him at Riviera. Padraig Harrington anxiously watches his tee shot on his final hole, the ninth, at Spyglass Hill in Satruday’s third round of the AT&T Pebble Beach National Pro-AmPadraig Harrington’s black cap might have sported the logo of one of the technology start-ups he invests in to keep himself entertained away from the course - Shaderlight, a 3D rendering company - but the head underneath was certainly elsewhere as he collapsed over the last five holes at Spyglass Hill to severely dent his chances of victory in the AT&T Pebble Beach National Pro-Am. Harringto and JP McManus during the Dunhill Links Championship. 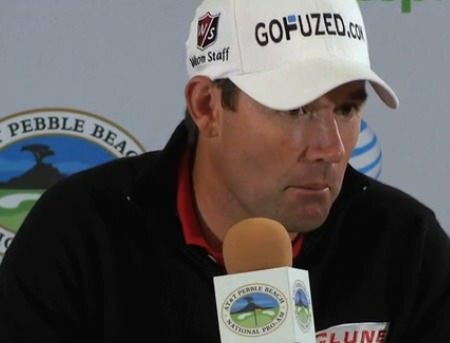 Picture by golffile.iePadraig Harrington got a win on Sunday at Pebble Beach, just not the one he needed to climb high enough in the world rankings to qualify for next week’s WGC-Accenture Match Play. The Dubliner closed with a two under 70 to finish tied for seventh on 10 under, seven strokes behind impressive winner Phil Mickelson, whose stunning 64 gave him his 40th PGA Tour title by two shots from overnight leader Charlie Wi (72) on 17 under. Pádraig Harrington is going to play a lot of golf before the MastersPádraig Harrington dropped three late shots for the second day running to slip from the fringes of contention to seven shots off the pace after the second round of the AT&T Pebble Beach National Pro-Am. Pádraig Harrington putting in South Africa earlier this season. ©Catherine Kotze/SASPA www.golffile.iePádraig Harrington had 36 putts in a two over 72 to miss the cut by two strokes in the AT&T Pebble Beach National Pro-Am as Shane Lowry’s Accenture Match Play presence remained in the balance.